HSBC staff in Cornwall have been raising money for one of the county’s oldest charities by raffling giant cupcakes. 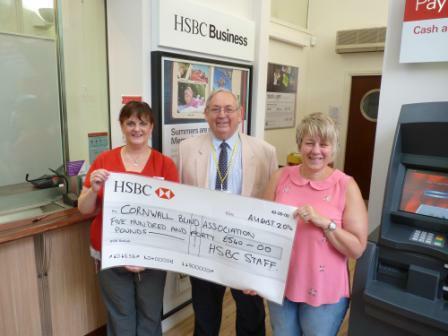 Jill Colton, who works at HSBC in Bodmin, has been raising money for The Cornwall Blind Association along with her friend Sharon Waters. Sharon lost her sight just over a year ago, but that didn’t stop her fundraising with Jill at Newquay Jive where they are both regular attendees. Jill said: “We have really enjoyed raising this money and are very grateful to HSBC who have matched funded it with their ‘£ 4 £’ scheme. Cornwall Blind Association was one of a number of charities that were affected by recent cuts to front line services by Cornwall Council. Receiving a cheque for £540 from Jill and Sharon, association treasurer Charles Whitehead said: “Firstly I must thank Jill, Sharon and the HSBC staff for this generous donation.